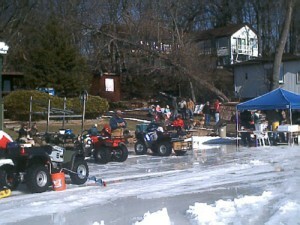 The Mike Zukowski Memorial Ice Derby will take place on Lakes Benedict and Tombeau, Saturday, Feb. 5, from 7 a.m. to noon. Prizes for Largest Fish of the Day in the categories of walleye, bass and northern pike. Raffle tickets will be available at the event only. Lunch will be from noon to 1 p.m. $20 per person includes entry fee and lunch. Children under 16 and seniors over 65 are free. Bring the entire family! Headquarters on ice will be near the Randall fire lane at 402nd Avenue. For safety, no autos or trucks will be allowed on the ice. All proceeds will be used exclusively for stocking and habitat improvement on Benedict and Tombeau Lakes. Posted in: Events, ice fishing, lakes, outdoors.